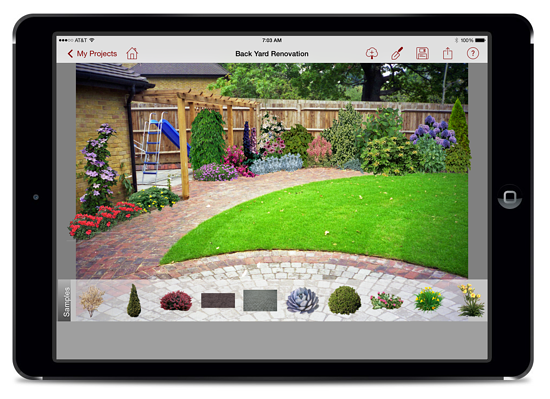 With the highest Apple App Store rating of all of the design apps on our list, PRO Landscape Home (image above) gives homeowners the tools they need to redesign their landscapes. 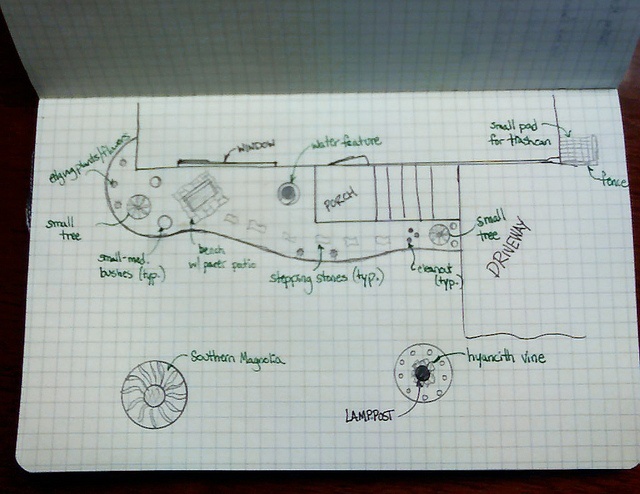 Pros: Users start with a photo of their home or garden and then add plants, materials and features. You can search for plants by climate zone, draw in grass or mulch, add focal points (like water features or furniture) and insert the original photo for before and after views of the project. Once you’re finished and happy with the design, you can save and share it on social media. Reviewers say it is a useful tool for DIY projects, easy to operate and helpful if you want to share your ideas with a landscape contractor. It’s free, but you can purchase access to the image library for $14.99 — which includes more than 2,000 landscape items. If you download this one, go ahead and pay for the image library. You will get a lot more use out of it. Platform compatibility: The app is compatible with iOS and Android phones and tablets. PRO Landscape also offers design apps for professional landscapers. The Eden Garden Designer app allows users to design spaces either using stock garden images or with photos from an iPhone or iPad. Then they can add foliage by searching the Plant Library by plant name, height, zone, color, blooming season, sun exposure and type. Pros: It has a 3.5-star rating on iTunes, and some of the biggest pros of the app are its ease of use, animation and ability to see what plants will look like in different seasons. Cons: The biggest reviewer complaint is the lack of plants available for free in the app. Platform compatibility: The app costs $1.99, and there are add-ons — like shade/sun and additional plants specific to your zone — within the app for additional charges. It’s compatible with iPhones and iPads. Based on the desktop Garden Planner version, the Garden Designer app allows you to put an image of the plan directly on your photos of the space. Pros: Its top features include having more than 600 objects in its library, being able to take and save photos of the image, adding/resizing paving and fencing, depth sorting and drag-and-drop capabilities. It’s efficient for simple designs, so it isn’t ideal for more professional-looking layouts. Cons: The biggest complaint for Garden Designer is from users who tried to pair it with incompatible iPads, as it only works with iPad 2 or newer. So, it’s important to make sure you have the right device for the software. Platform compatibility: The app costs $9.99, and is available for the iPad. iScape rounds out our list of Top 4 apps with its three versions: iScape Free, iScape and iScape Elite. The free version allows you to test out the full version, so I would only recommend that one if you want to see it before you buy it — not as an actual design tool. The iScape version is $5.99, and the iScape Elite, which is targeted to professional landscapers, is free to download but requires a paid subscription. Pros: Some popular features include a texture tool that allows users to add or replace ground covers like grass, mulch, pavers or stones; the ability to save and share images; and being able to use photos from the phone. Its database includes trees, shrubs, flowers, grass/groundcover, tropical plants, planters, water features and hardscapes. Cons: Like some of the other apps, the main reviewer complaint is that iScape doesn’t have enough plants to choose from — or if they have the plant, it costs extra to use it. Platform compatibility: The app had an update last month to fix some of the bugs. It works with Apple and Android devices. There are landscape design apps available for a variety of skill levels — from avid gardeners to professional landscapers. Once you’ve found the one for you and designed your space on a smartphone or tablet, turn it into reality by pulling old or dead plants and replacing them with new ones. You can throw plants and other landscape materials directly into a dumpster rental, instead of trying to bag up everything. When it’s time for your next yard project, find a local dumpster rental franchise operator near you and download our FREE eBook to learn just how dumpster rental will help make your life and next landscape renovation a little easier.